Please see correction on timing of FHB spray from Christina Cowger, last update was in error. Important note from Christina: If scab is your target, you will only profit significantly if you apply fungicide between early flowering and up to 7 days later. Fungicide applications before flowering will give little to no scab control. This is because the scab fungus attacks the heads through the flowering parts (anthers) once they are extruded. Bottom line: use Propiconazole or Tebuconazole to correct any early problems. Then, if there is medium to high risk of scab, which you can see at the forecasting site www.wheatscab.psu.edu, put out Caramba, Proline, or Prosaro at early flowering or, if it is too wet then, up to 7 days later. This approach should decrease your exposure to FHB while keeping the other diseases in check. I will be sending out FHB update as soon as I prior to wheat flowering. Foliar insecticide treatments for aphid control: A well-timed insecticide application of a persistent pyrethroid insecticide such as lambda cyhalothrin (Warrior, Karate, Lambda, Silencer,other(s) will kill aphids and reduce the incidence of BYD and increase yields. Information from: Christina Cowger, Small Grains Pathologist USDA-ARS North Carolina State University, Intensive Wheat Management in Georgia and 2015 Georgia Chemical Handbook. If you have some time, below is a link to a very good article. But if you don’t have the time, the meat of the article on combine settings is below. Follow the below to help reduce vomitoxin in your wheat harvest. Adjust combine so lightweight, shriveled kernels are also removed with chaff. The goal is to blow the lightweight, diseased kernels out the back of the combine without blowing out too many good kernels. This technique is feasible when the rest of the grain is of good quality. In fields severely affected by leaf diseases, the lower test weight of the grain may make it more difficult to separate normal kernels from Fusarium damaged kernels. These photos were taken today (4/19/15) south of Blountstown, Fl. I have never seen a field so completely covered with rust and septoria. This could happen to your fields if you did not spray on time. At first I thought Wheat Take All, but this is the first I have seen wheat in this field. It was following peanuts. This field has had rain for several days straight. You need to spray as late as possible per the label of fungicide used, because most fungicides do not translocate well in the plant. We need to protect the head of wheat and the flag leaf during this time. If you see rust call me. I have seen very little rust but lots of Septoria, Stagonnospora leaf blotch, Powerdery mildew, BYD and Tan Spot. Absolute 500 SC, Headline , Stratego, Quilt, Quadris, Folicur+Tilt , or one of many others. All should be put out at per the label of fungicide used. Aphids are out , but you need to have 10+ per flag leaf before you treat. Always watch for beneficials. 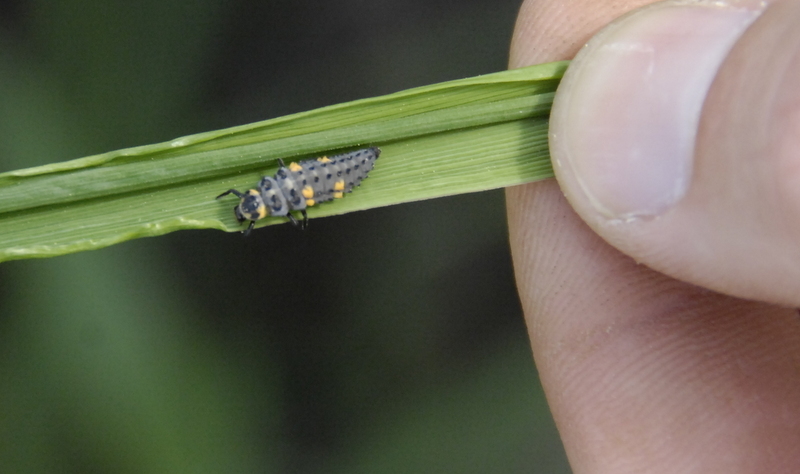 Lady bugs, Aphid lions (lady bug larvae), parasitic wasp, and syrphid fly larvae all eat aphids. Foliar insecticide treatments for aphid control: A well-timed insecticide application of a persistent pyrethroid insecticide such as lambda cyhalothrin (Warrior, Karate, Lambda, Silencer, others) can reduce the incidence of BYD and increase yields. Lambda cyhalothrin can only be applied twice to a crop so use another product at heading such as Baythroid XL or Mustang MAX/Respect. These can be combined with a foliar fungicide application and also will control cereal leaf beetle if it is present. Always follow all label instructions. If you did not get ¾ of an inch or more of rain in the last week you may need to water. Dig down 2″ and if the soil does not hold shape when balled in your hand, then water. It is best not to water when flowers are visible on more than 25% of wheat heads (FEEKES 10.5+); just wait until flowers fall off (about 3 days later). You need ¾” to 1” of water (rain or irrigation) every week until 75% of wheat heads in your field are at Soft Dough Stage. Do not over water wheat. Today, I think wheat (AGS 2035) planted on time is 4-5 days ahead of last year. Most wheat is at Feekes early 10.2 or older. This means the wheat head is visible in the leaf seath. (AGS 2035 planted 11-24-2014 in Seminole county is at Feekes 10.2 to 10.4) You need to spray as late as possible per the label of fungicide used, because most fungicides do not translocate well in the plant. We need to protect the head of wheat and the flag leaf during this time. If you see rust call me. I have seen very little rust but lots of Septoria, Stagonnospora leaf blotch, Powerdery mildew, BYD and Tan Spot. Fungicides: Absolute 500 SC, Headline, Stratego, Quilt, Quadris, Folicur+Tilt, or one of many others. All should be put out at per the label of fungicide used. 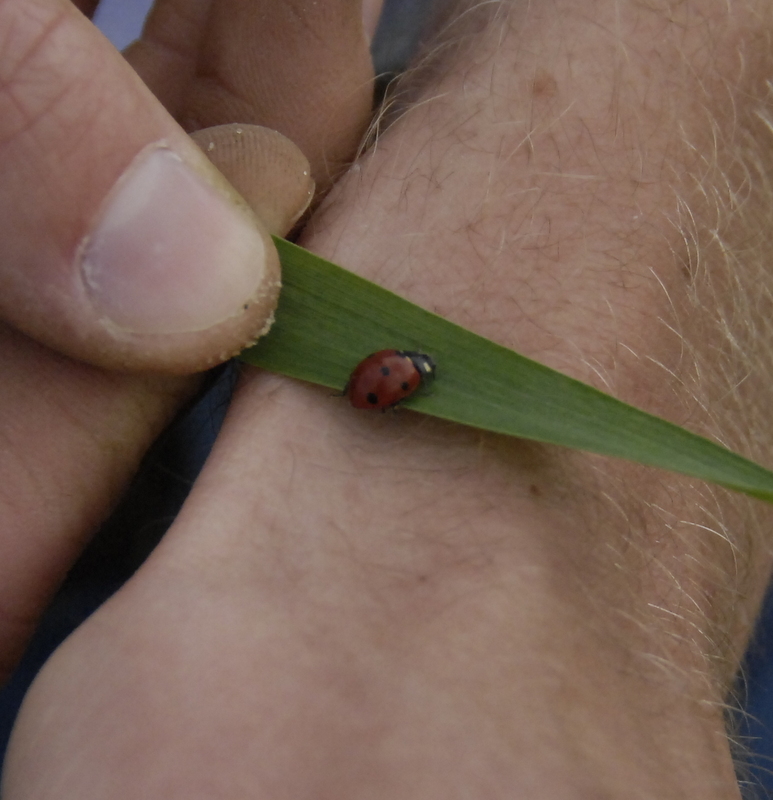 Aphids are out, but you need to have 10+ per flag leaf before you treat. Always watch for beneficials. Lady bugs, Aphid lions (lady bug larvae), parasitic wasp, and syrphid fly larvae all eat aphids. As always, follow all label instructions. Rust, Stem, Stripe , or Leaf. Do you have it? Most new southern varieties are Rust resistant. Now we have that out of the way – what is in your field? Compare the wheat you planted against the UGA 2014 wheat chart. 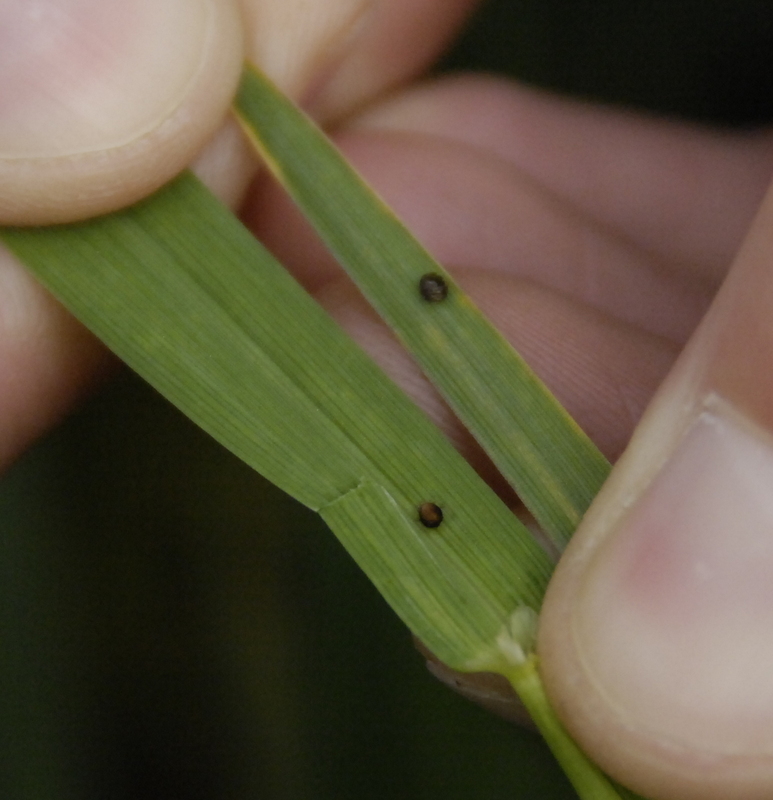 This resource will help you in determining what could be in your wheat. Rust. Please check using a white cloth to see if you can rub off any spores. The colors to look for are red/brown, yellow, orange, or any combination. (See LSU chart below.) Wait two days after a rain to do this as rain will wash off the spores. Rust is very aggressive when the temperatures are right and must be controlled quickly. Do not allow many days to pass before you check your fields. Call me if you find Rust on a AGS variety. Powdery Mildew and BYD (Barley Yellow Dwarf). Look for white to gray powdery fungal growth on leaves and leaf sheaths. Tip yellowing, purple leaves, and/or twisting of leaves are symptoms of BYD, which is a virus, and fungicides will not control it. You must put something out to control aphids before you get the virus. See LSU info on BYD below. Cold/Frost Damage. You could just have cold/frost damaged wheat. The conditions have been right cold-frost damage, and some early planted field have it. Yellowing, streaking, tip burn, and purple tips are caused by frost/cold damage. Manganese Deficiency. Manganese is another problem in fields with HIGH Ph. 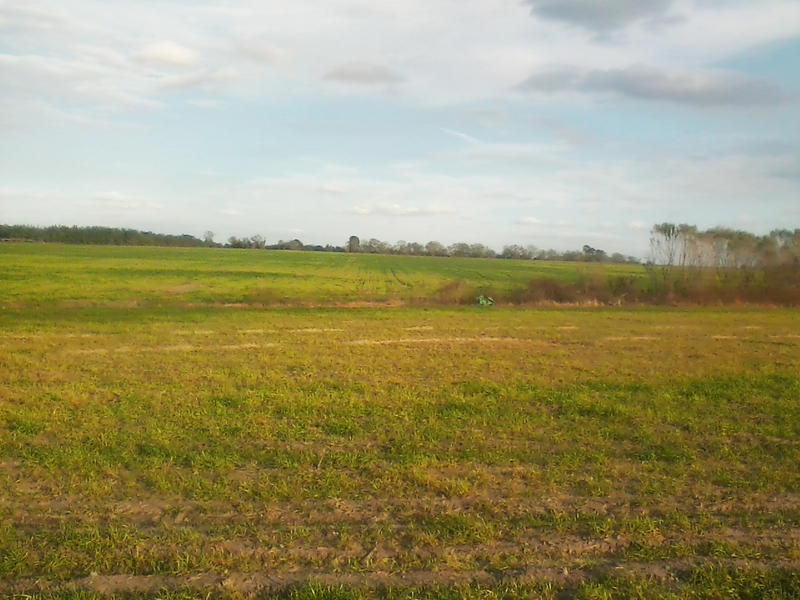 The photo is of a confirmed manganese deficient field. I generally find the flag leaf to be the one of the things I want to protect, along with the wheat head. Leaf Blotch, Fusarium, and Glume Blotch must be controlled to have good wheat yields. Fungicides do not trans-locate well and need to be on the surface they are to protect. Please wait as long as possible or if you must spray early then plan to spray twice. Tissue test your flag leaf. Do not get the largest tiller in each plant, as it will get the first choice of N and give you a skewed reading. I prefer to ample from one of the smaller tillers because that is where your yield will be increased. 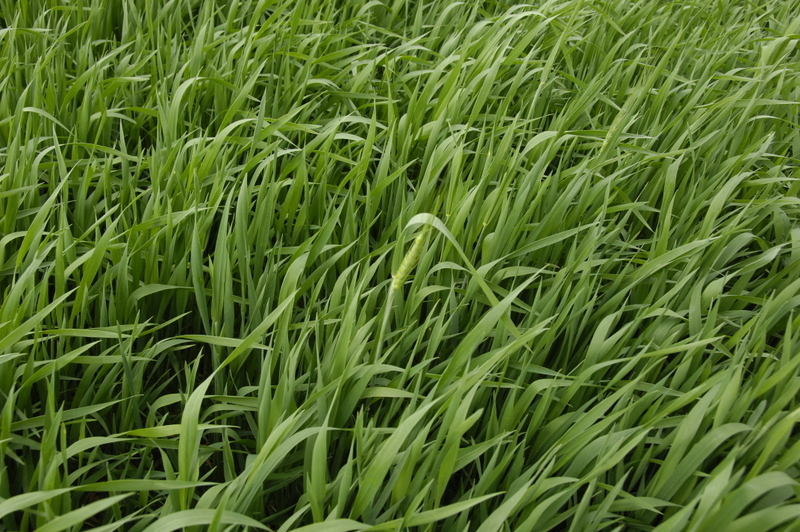 These smaller /later tillers will dry-up if you do not have proper fertilization. *Information obtained from 2015 Georgia Pest Control Handbook (http//www.caes.uga.edu/publications) , Intensive Wheat Management in Georgia, and LSU. As always, follow label and dispose of empties properly. If your wheat/oats are 4 inches (three or more tillers) tall or taller then you may need to put out your winter weed control. The weeds have really been growing because of the warm weather, and also can really hurt your yields. Chemical prices are up this year so please don’t cut out application because of the price, it will pay to control the weeds. Take time to walk your wheat fields while the wheat is still young and you can count the plants per foot of row. If you find a row that is too thin or too thick flag that row on your drill and correct the seeding rate before you plant next year. A count of 18-20 plants per foot (7-8 inch row) is great, 25-30 is way too thick. Harmony Extra SC, per label always add surfactant per label. Express Plus MCPA, per label always add surfactant per label. Gives good to excellent control on most winter weeds. DO NOT USE THIS ON OATS. POWERFLEX and others, per label gives excellent weed and ryegrass control. Read label for plant back restrictions. ** Information obtained from 2014 Georgia Pest Control Handbook and Intensive Wheat Management in Georgia. As always follow label and dispose of empties properly. 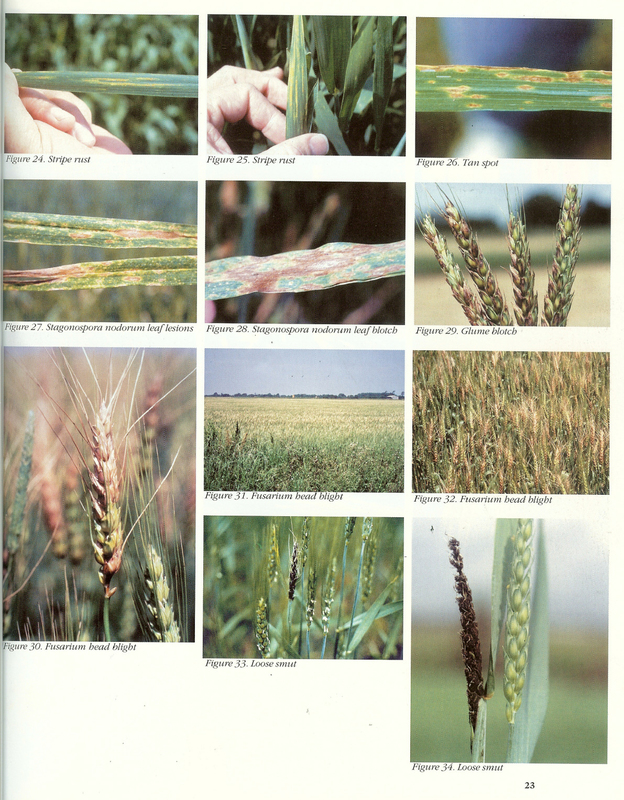 Most wheat is at Feekes scale 10.1 or older, this is often called the early heading stage. At this growth rate wheat is about 3-5 days behind normal heading date. You need to spray a late as possible per the label of fungicide used, because most fungicides do not translocate well in the plant. We need to protect the head of wheat and the flag leaf during this time. You may want to add an insecticide to help control aphids and stink bugs. 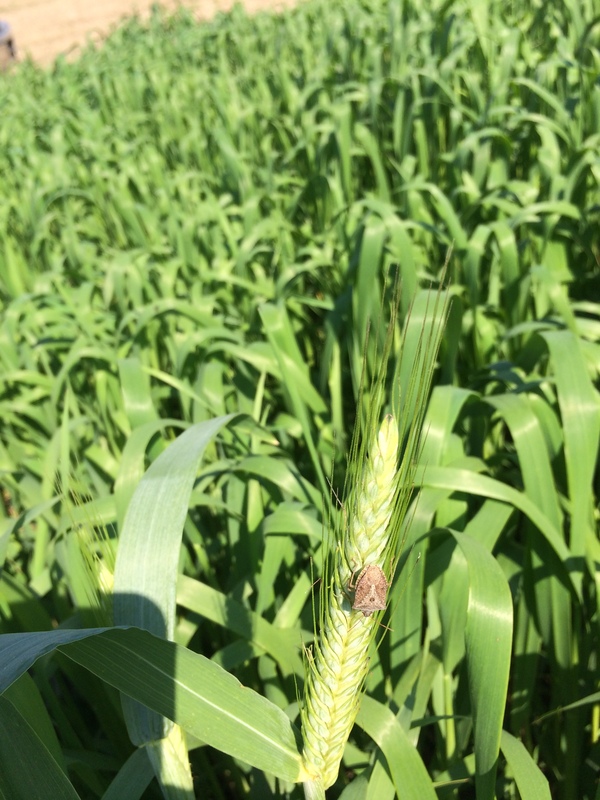 The picture below is a stink bug on the head of triticale in an oat field. Headline, Stratego, Quilt, Quadris, Folicur+Tilt, or one of many others. All should be applied per the label of fungicide used. Most full heading (10.3) should occur before April 1, 2013. Please be sure to visit and support this site, www.georgiaweather.net – it has a lot of good information. Rome recently wrote a good post on his blog about wheat conditions – it had some very good information. Wheat is jointing well and some early planted early varieties even have a few flag leaves emerging. Powdery mildew disease is a concern but with warmer temperatures it usually calms down. We are watching for Stripe and Leaf rust now. 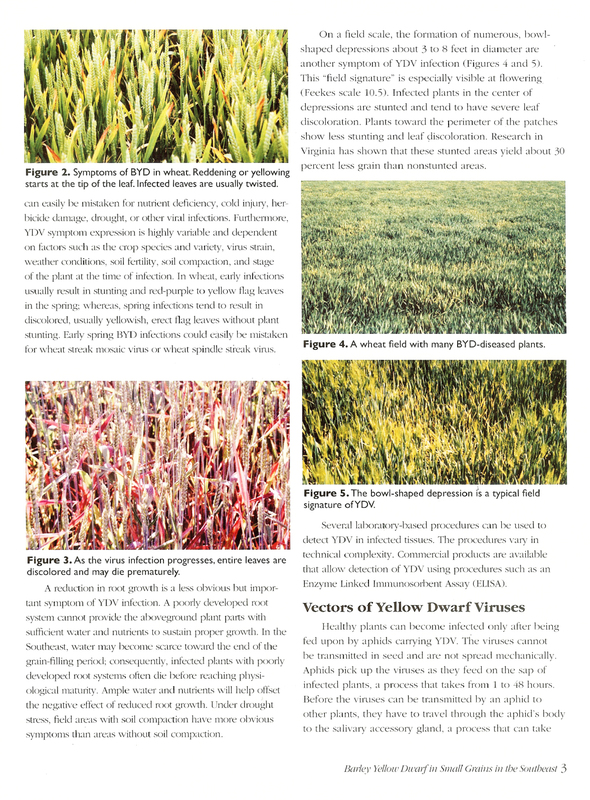 Here’s an update from Extension Plant Pathologist Dr. Alfredo Martinez-Espinosa.“Powdery mildew (Blumeria graminis-Syn Erysiphe graminis) infections on wheatfields have been reported and confirmed recently across the state, especiallyon the southwest part of the state. Weather has been conducive for the disease.Powdery mildew tends to diminish as temperatures consistently reach above 75ºFand RH falls below 85%. If powdery mildew progresses up the plant and is foundin upper leaves (flag leaf minus 2) you might consider a fungicide application.”Aphids are still present in wheat fields but we are getting to a point in the season to where I’m not too worried about them. Also, we have lots of beneficial insects working on them pretty well. 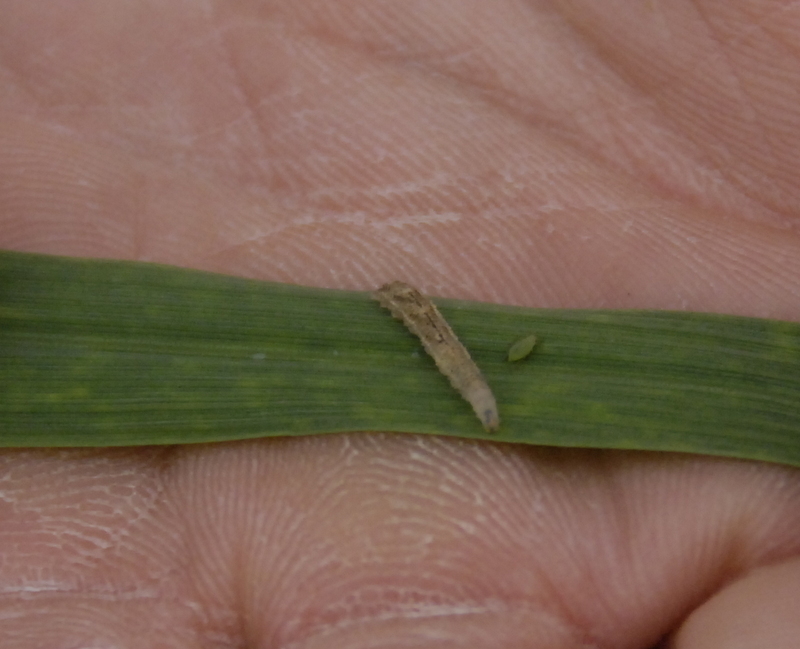 Decatur County Agent Justin Ballew and I found lots of syrphid fly larvae feeding on aphids yesterday as well as a few lady beetles and their larvae and lots of wasp parasitism by tiny wasps causing aphids to “blow up”.Here’s some wheat with some flag leaves emerging and a head or two. Syrphid fly larvae chasing an aphid. These aphids have blown up in size and are dead due to being parasitized by wasps. Lady Beetle and below that the lady beetle larva are good aphid eaters. Posted by romeethredge on March 14, 2014. The LSU Ag Center Research & Extension recently sent out their latest wheat newsletter. Click here to read.